Children at Sompting Abbotts have taken over the running of their school library. The project is a bid to counter the reading decline due to digital devices. It has worked. Their enthusiasm for books has soared! It’s Wednesday morning break time and there’s a crowd of children in the school library. Some are browsing; others are queuing at the desk to return books and take new ones out. But there’s something different about this school library. It’s the children who are running it! A rota of six Year 8 librarians now oversees the library, taking turns each morning and afternoon break to man the desk. 'We’ve introduced a new lending system,' says Year 3 Teacher Mrs Kelly. 'We've gone 'old school' and have library tickets and date stampers. It’s been a lovely trip down memory lane!' The librarians are responsible for all aspects of 'customer service' such as issuing books, restocking and keeping the shelves well ordered, issuing returns notices and making reservations for popular titles. There’s plenty of choice. The library houses some 5,000 books – everything from the classics to popular contemporary titles and non-fiction. The Internet doesn’t have the monopoly on knowledge. A recent report by the social sciences journal Inquiries concluded: 'Overexposure to technology can adversely effect reading habits, and negatively impact development and personal interactions during a child’s formative years'. That said, there’s no denying that tech is going to be an essential part of our children’s working lives ahead. But there’s nothing quite like the feel and smell of ink and paper. E-readers have their place but paper makes reading physically pleasurable. ‘Real’ books are also notably absent of screen fatigue. 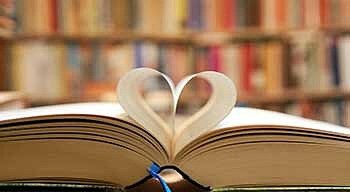 Encouraging a life-long love of reading. During National Library Week, the school organised a packed week of book themed fundraising activities. This included a visit from Jonathan Bailey, Head of Publishing at GMC Publishing in Lewes. There was also a book quiz, book-based treasure hunt and a Library Bake-Off, with cake designs themed to children’s favourite books. A highlight was the school sponsored read. The class that had the highest pages reading average won a prize. Altogether, over £650 was raised from the activities for new books. Access to books is critical for brain development and academic success – doubly so in the digital age. Even more importantly, books expose children to the world beyond their immediate surroundings and to possibilities. It seems all the more important that school libraries should be well used given the funding constraints on local authorities that have seen library budgets slashed and library closures across the UK. Children are also allocated DEAR (Drop Everything and Read) time in their weekly Form Tutor session. In this, the Year 8s listen to the Year 3s read. 'Doing this gives the younger pupils the chance to bond with the older ones while they practise their reading skills too,' says Headmaster Stuart Douch.